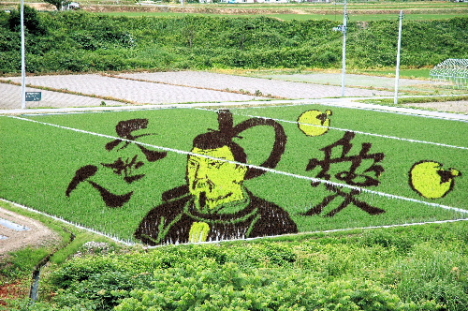 Using a strain of rice called Kodaimai the farmers in the town of Inakadate in the prefecture of Aomori create some fascinating works of art. I would call it the Japanese version of crop circles that we see here in the corn fields of America. Except this looks more like art and less like geometry. 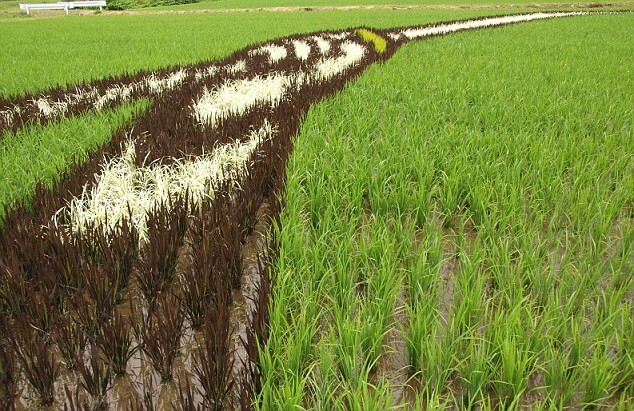 I have always been fascinated how some folks will take the time in there live(s) to create something really beautiful and/or interesting even when the work to do so makes a difficult task more difficult, in this case rice farming. I found these images and story(in English) at Pink Tentacle(interesting name). Many thanks. Oh; check out the story about fragrant pencil lead-seriously. It is wonderful when people add unexpected elements of creativity to their daily tasks. This is an inately human thing to do… if we let ourselfs. You, of course, make your living with your imagination. But remember that we are all fundamentally alike. We all have the same needs, whether we recognize or satisfy them… or not. What is MOST appealing about this (to me) is the evanescent nature of it. It is not meant to last at all. And that is part of the magic. Like Hank, I love that the everyday, mundane act of planting rice was done with such planning for beauty. I think that this is what people are missing in their lives of instant dinners and Pay-Per-View movies… learning the art of living a beautiful life. I too find great appreciation in those working with ephemeral art. Craig is right about Goldsworthy, his stuff is awesome, at least to me and a large group of “others” his books have been very successful. I know a few stone masons who have worked on several projects with him and they say he is very ‘exacting’ in what he is after. I’m sure this helps in setting hiw work apart from others. nice line . . . “learning the art of living a beautiful life. Vote for the Worst of the Worst-Shrub.